Aging, deterioration and extreme events like earthquakes and hurricanes can take a toll on roads, bridges and other structures. With damage and defects often invisible, the search is on for systems that can monitor the health of structures and alert their owners to potential problems and even impending catastrophic failure. 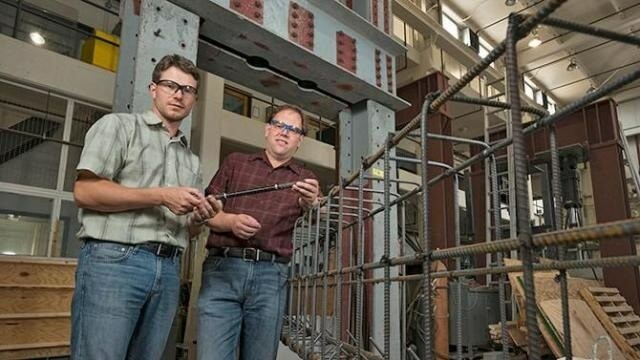 Several years ago, Erik Thostenson and Thomas Schumacher, both affiliated faculty members in the University of Delaware’s Center for Composite Materials, began to explore the use of carbon nanotube composites as a kind of “smart skin” for structures. Now, they have improved on this approach with the addition of another technique called electrical impedance tomography (EIT), which uses surface electrode measurements to create an image of the conductivity of a material or structure. While EIT has been used as a noninvasive medical imaging technique since the 1980s, it has largely been overlooked by the structural health monitoring community. The UD team’s development of the new approach, which applies EIT to a distributed carbon-nanotube-based sensor, is documented in a paper published in the Journal of Nondestructive Evaluation in June. The nanotube composite sensor can be adhered to virtually any shape to detect damage and to show its location within the material or structure. Other advantages are that it is mechanically robust and that its electrical properties are isotropic, or the same in all directions. For Schumacher, a structural engineering researcher who envisions using the technique on in-service structures, major benefits of the new sensing technique are that it can be scaled up and that it is relatively inexpensive, as it doesn’t require a large quantity of carbon nanotubes. The recent paper documents the team’s initial evaluation of the methodology, first by introducing well-defined damage and then by investigating a more realistic damage scenario to show the capability of the approach to detect impact damage on a composite laminate. The resulting EIT maps were then compared to visual inspection and thermograms taken with an infrared camera. The research was supported by the National Science Foundation Division of Civil, Mechanical and Manufacturing Innovation, Award No. 1234830. The paper, “A Novel Methodology for Spatial Damage Detection and Imaging Using a Distributed Carbon Nanotube-Based Composite Sensor Combined with Electrical Impedance Tomography,” was co-authored by Hongbo Dai, Gerard J. Gallo, Thomas Schumacher and Erik T. Thostenson. Dai will defend his doctoral dissertation during summer 2016. Gallo, who earned his master’s degree in mechanical engineering at UD in 2015, is a materials and process engineer at Boeing in Charleston, South Carolina. Schumacher is now an assistant professor in structural engineering in the Department of Civil and Environmental Engineering at Portland State University in Oregon. Thostenson is an associate professor in the Department of Mechanical Engineering at UD and an affiliated faculty member in the Department of Materials Science and Engineering and the Center for Composite Materials.